It has become the platform for everything. I find myself amazed at how it’s being extended. You are hear discussions of Web Application Frameworks, mobile integrations, Content Management System and the occasional reference to blogging. That’s cool and I’m happy for the platforms success. This is more evident to me being what I do — website security. The more people I talk to, website owners like you, the more I realize how little they know what they have installed and why. Often the response is, that’s what it was built on, or that’s what I was told to use. Yet you ask them why they have it, or if they know about certain configurations, and the response is always a resounding no. I remember when John O’Nolan first published the idea of Project Ghost, like many I had my reservations. In my mind I thought it as going to be another rendition of WordPress, eventually just failing. Over the past year or so, I’ve been very impressed with it’s progression and he’s being doing what I think to be an amazing job, building something from scratch. How beautiful is that? This isn’t a fork, this is new build!! It exceeded it’s KickStarter campaign, has started to build a community, and has introduced a new business concept — Non-Profit organization that supports itself via it’s own recurring revenue model. As a business professional I find that fascinating!! It has one purpose, and only one purpose: enabling digital publishing for the masses. Enabling people with more important ideas and things to say than I ever will to publish content online — quickly, easily, beautifully and efficiently. 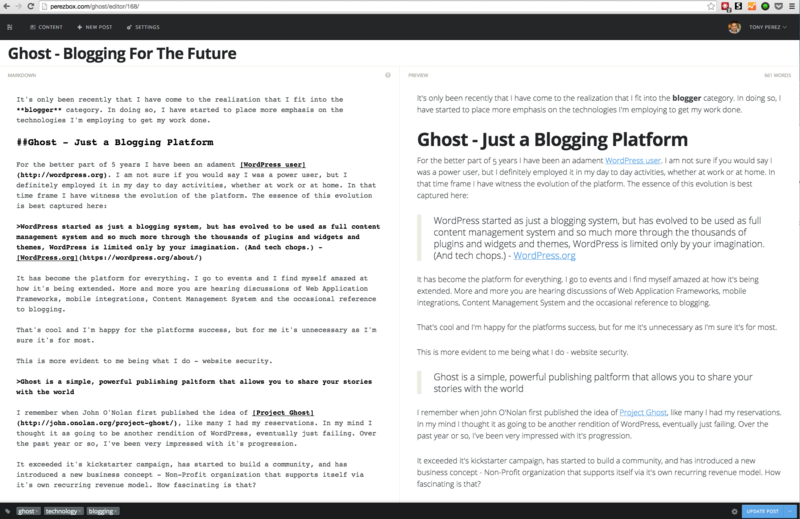 Ghost is about breaking down the same barriers that WordPress originally did. I’m happy to report that the process of content creation is as beautiful and simple as John first described. It makes use of markdown which is plain text formatting syntax. It means if you know how to use an editor you’re set! I can confirm that the experience is definitely seamless, and what you would expect as a content creator. This is not without it’s challenges though. If you’ve been on WordPress for a while you’ve gotten spoiled with things like categories and features you expect to be default. Things like filtering Posts from Pages, search within your dashboard; yet when you really think about it, these are easy things to get around. There is no denying that the platform is today, what WordPress was 11 years ago. With that comes some challenges and sacrifices. As a blogger though you get the basic elements you need to easily write and share your content. I’m still looking for that Dashboard I might want to use John! The installation and configuration leaves a lot to be desired at the moment; but I hear great things are on the horizon. I’d imagine it’d be what most folks will complain about. Especially in a world where they are used to easy, in a world where they have been told they don’t need to know system administration or have never heard the term web master. In that regard however, it’s a breathe of fresh air. There were a lot of lessons learned in this migration and I’ll be sharing that in the coming days. As a blogger, the good news is that you the option to Host or Self Host the platform. You can easily try it out on the Ghost website. If you’re truly only concerned with creating content, why would you bother hosting yourself? Unlike the WordPress ecosystem, when you host with Ghost you are directly supporting the platform. There isn’t this awkward configuration of For-Profit and Non-Profit heirachy that no one can really understands or appreciates. They have a fairly young Marketplace, where you’ll find both Free and Paid themes you can leverage. I imagine that will be attractive to young development / design shops. Most have good documentation, but if you self-host be fore-warned you’ll have to have some technical knowledge of how server technologies work. I also love that the platform is based on some of the coolest technologies on the market, things like node.js. Last, I can’t talk ever think or talk about web technologies without considering my threat landscape. WordPress for all it’s awesomeness has a lot of challenges, specifically when it comes to Security. It’s one of those things no one really likes to talk about, but it’s the big elephant in the room. Fact is that while it used to be that you could say there haven’t been any major issues with the core of the platform, that’s not exactly the case anymore. Just look at the most recent 4.0.1 release. This coupled with the state of affairs with vulnerabilities being disclosed on plugins and themes via resources like the Sucuri Blog or WPScan Vulnerability database is enough to warrant serious concern for any WordPress user. Complex things breaking complex ways. This is to be expected though, it’s the price of fame and complexity. Either way, it’s enough to make you think about the risks. Even with the various tools and configurations I have in place, the additional steps I take, the target is so big and attacks so heavy, that sometimes it’s enough to make you reconsider your options. I am a fan of simple, the Ghost platform offers me this. While I can’t talk to the code, yet, but stay tuned, it offers me the peace of mind that it’s so small that attacks are practically non-existent. The way it’s built introduces a number of challenges as well for hackers and while this won’t be the norm for ever, especially as it continues to grow in popularity, it’s definitely a sigh of relief in today’s environment. Interesting to see other Security minded people taking similar actions, most notably is CloudFlare’s Migration to Ghost. Do you really need a CMS and the complexities it introduces to blog?